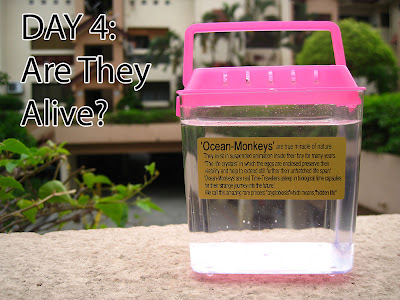 Day 4: My Sea Monkeys Are ALIVE! I kinda screwed up on the Day 1 procedure. Was suppose to add water conditioning to the water for 12 hours before I can add the instant eggs sachet. What I did was pour mineral water into the tank, add eggs and then realize maybe I should add the water conditioning powder (it's to condition the water from harmful poisons/chlorine etc). 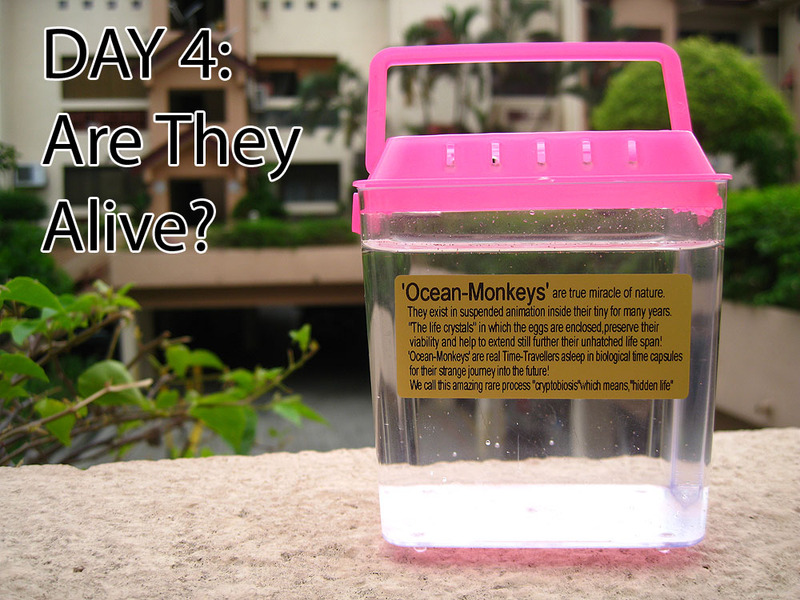 Anyway I screw that up on Friday and left my sea monkeys at office. In the weekend I thought they'll probably not hatched coz I screwed it up or they have hatched and is hungry?! I read that I need to feed them only once a week. see my babies?! they're swimming and very small! YES thank goodness they're alive! and while I see some eggs still not hatched yet, plenty of babies are already swimming like mad Malaysian drivers in the water. They're so tiny, you need a magnifying glass to see them. I circle them for you to see, those which is obvious enough to point out. My colleague Nina was shocked at this, she's wondering why I have a mini tank in my room and she don't believe there's such thing as instant pets! (until I show her they're all swimming inside). Really small, I hope they grow big soon! Sea Monkey's Hidden Treasure Glow in the Dark Tank! 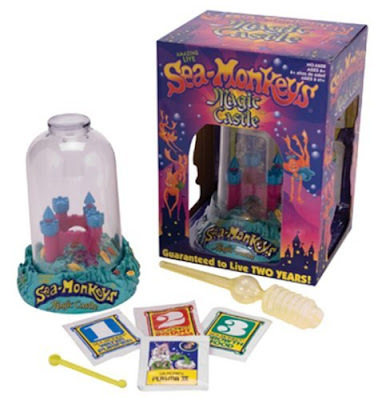 Online Shop that sells Sea Monkey Tanks & Starter Kits click here! (I have not purchase from them before, anyone here bought b4? hope they're bukan tipu ppl punya). 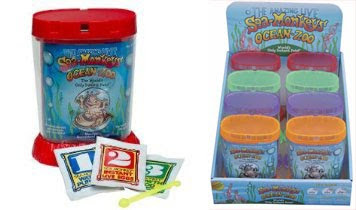 It's much more expensive buying these sets which is different from normal pet stores "sea monkeys" use for feeding fishes. The commercialized sea monkeys sets are cute, more fun and their life span is longer too (up to two years). However it will be a task keeping them alive for more than few days! as I found out online lol and from friends. The mini tank kit that I bought from One Utama is RM18 only. You can read from here Day 1 of my experience. I saw those crystal grow one at toys r us. 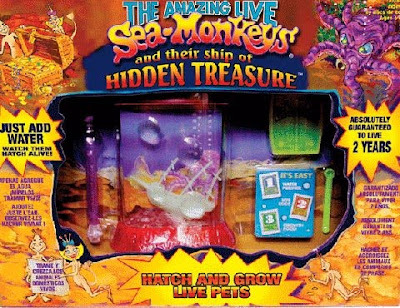 ooo emmm geee.... i tgk sea monkey u and now i want it tooo!!!! NQR: kekeke!! but day 18th now n i have only 1 surviving sea monkey sob sob n still a baby! T_T looks like need get another rm18 kit to make friends for my sayang satu. hey i also bought a kit.. but it's called ocean monkeys.. probably an imitation.. sigh.. but so wanna try anyway. Did u use the whole pack of water conditioner? cos looks a bit too much for the little water in the aquarium ya? yeah i did, according to the seller/distributor.. need to use whole pack of what they give u, it's minerals also for the sea monkey to grow and survive and plus, can stay on the bottom of the tank for a long period of time. 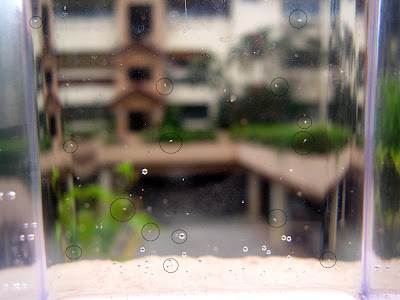 omg i only used 1/4 and so far no sea monkeys hatching.. imma gonna top it up now! thanks!! top up and have to wait few days for hatching, i read online once the water is right, they will hatch.